For the third of four performances in Illinois over the weekend of July 9-11, The Viper and His Famous Orchestra brought their 7-piece sound to the beer garden at Mike N’ Molly’s in Champaign, following the solo/mixed set by Edward Burch, there to launch the new Jay Bennett album, Kicking at the Perfumed Air (see jaybennett.org), and all following the Champaign Music Festival at which Hum rocked for Champaign’s 150th Anniversary (John Peacock preferred the band with horns on the other stage; and I suppose you’d have preferred an astronaut. We’ll be back in Champaign again on September 25, at Mike N’ Molly’s, as part of the Pygmalion Music Festival. 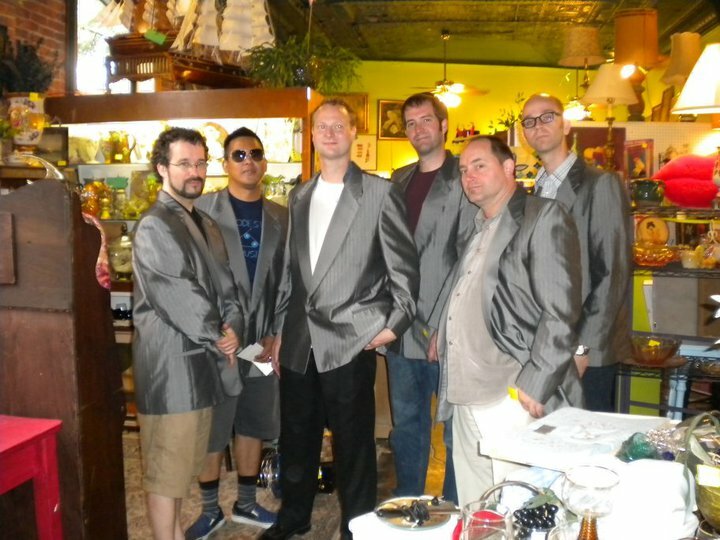 The next day, we stopped into Carrie’s Antiques & Jewelry and almost bought matching suits, you know, like the News.